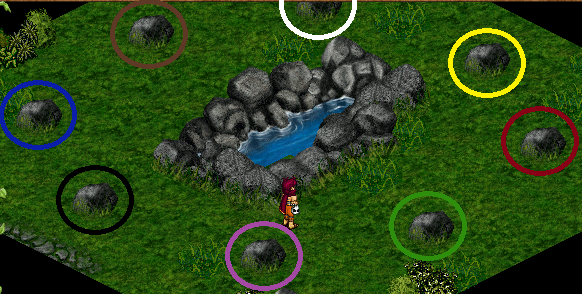 At some point every Monk will need to visit the Sapphire Stream and progress towards at least the Red Dugon. Even though it's an outdated system and a huge chore/goldsink it is still very important because you get some of your most important skills and spells from the Trainers here. Here are the levels and students required for each color dugon. The Sabonim is the person who is doing the teaching. They are often a higher level and more experienced. The Sapphire Stream was probably founded so that monks had a way to hand down their combat skills and knowledge. Dugons can be learned alone but require you to teach others in order to do so. You may teach people the colors below yours as long as they meet their own requirements for that color. For example you may teach somebody the Blue Dugon if they are level 33+ and have taught 2+ students themselves. The student is often referred to as a "Hubae" or "Hub" and it is standard practise for them to take gold in exchange for the Legend Mark they will give you. Double check that both the Teacher and the Student have full labor! The Student begins by saying "Sabonim, Please teach me the [color] dugon" aloud. They will receive a popup asking if they wish to learn it alone or with a Sabonim. If they are having somebody teach them they must type that person's name. The Teacher will accept and then the Student will given another popup asking them to kill a certain creature within 3 hours. The Teacher may help with the kill but the Student MUST deal the final blow. Note: To learn a dugon yourself use the same procedure except click alone. Once the creature is dead return to Sapphire Stream and the Student says "Sabonim, Please teach me the [color] dugon" aloud. Sometimes it may bug out and will need to be said again. If the kill was successful the Student will now be told to meditate in the room to the right. When the Student is inside they must walk to the respective color stone to receive a popup and click meditate. Use the Monk Meditations page to select the correct option. If they mess up they will need to be labored and try again. Selecting the correct option will give a message saying "Aha!". The Student may now leave the meditation room. When they're back outside they can type "Sabonim, I understand the [color] dugon" to complete the training. The Teacher will receive a stacking Legend Mark: "Sabonim of # Dugon". The Student will receive the Legend Mark: "[Color] Dugon by [Teacher's name]". The Student may now Craft a Dugon and learn any new Skills or Spells they may have unlocked.